I thought that I could squeeze today's news updates into the end of yesterday's big Weekly Famitsu translation post, but it turned out that there were too many and the post became too long. Here we go! The official Sengoku Basara 4 website has now been updated so I've added pictures to my original article. The front page has changed to show the game's cover artwork and there's a new (very short) teaser trailer. The Kyougoku-Azai army character profiles will be available on 14th November. The trailer isn't the only sign that the marketing for the game has begun in earnest. Twitter user @foi1059 posted a snapshot of a gorgeous two-page advertisement for Sengoku Basara 4. Gaming websites such as Famitsu, 4Gamer, Dengeki Online and Gamer have now started to cover the new reveals with higher resolution pictures. "...and separated from his beloved Oichi so she could enter into a political marriage to Azai Nagamasa. Katsuie wasn't able to tell her how he felt. In the midst of his despair, he wonders what he's living for." The news report also notes that the CLAMP illustrations will include pictures of Yukimura/Sasuke, Naotora/Oichi, Yoshiteru and also one other, which they're keeping secret for now. This is in addition to CLAMP drawing Masamune, Mitsunari, Sakon and Katsuie for the book as previously reported. The other details are as reported in my earlier post. Amazon Japan is now listing the magazine for purchase, too. On the subject of Ieyasu, the official Sengoku Basara twitter account had some fun this morning pointing out the button detail on his Gakuen Basara DLC costume. Shuueisha's Sengoku Basara 4 strategy guide has been spotted at Manga-Oh, for release on the same day as the game itself on 23rd January 2013. The sold-out Sengoku Basara Magazine CD: Showgeki Basara Talk! Vol. 1: Masamune & Kojuurou No Maki Special-ban disc is also getting a second press this winter for those who missed it the first time around. A short introduction to the Butai Sengoku Basara stage plays has been placed on YouTube courtesy of TV Asahi after its original broadcast last weekend. It's been created to promote the current stage play, Butai Sengoku Basara 3 Utage Two. Official videos covering the series are rare so I thought it was worth a mention! There are a few stray pieces of information from previous reports and yesterday's Weekly Famitsu article which I want to draw particular attention to as we draw closer to the final character reveals. We're up to 30 characters revealed now out of the 40 promised. We've seen characters such as Kasuga, Yoshitsugu and Hisahide appearing in promotional videos already, and there have been sightings of the Shimazu and Uesugi armies' flags in the past. But those aren't the only clues, and today I want to talk about stages. We've previously been shown pictures of the march screen with points marked on the in-game map where we'd expect to see Hetsugigawa (Sourin/Muneshige), Hasedou Castle (Yoshiaki) and Itsukushima (Motonari). The latter is supported by this glimpse of Itsukushima's world famous torii which Japanese fan @hananohiyoko125 spotted in today's magazine. While it's not certain which characters will be assigned to which locations in Sengoku Basara 4 - the status of all four of these characters is still unknown - at the very least there are strong hints that we'll see them appear in the game. In addition to this, this week's magazine mentioned some interesting 'outbreak' encounters. The battle which immediately stood out to me was called "Revenge: the sword of the God of War". The God of War is obviously Kenshin, and his 'sword' might refer to his 'beautiful blade', Kasuga. If it's a revenge encounter, could something have happened to Kenshin in the storyline? Is it a hint he'll be a non-playable character again this time, or could this be a flashback? I guess we'll have to wait before finding the answers to these questions. 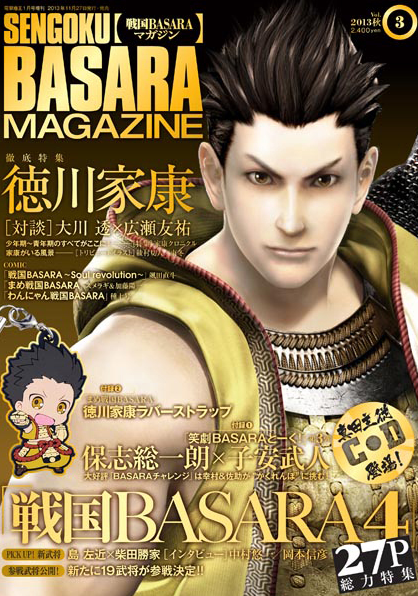 I'm expecting (at least) two more characters to be announced in next fortnight's Weekly Famitsu to get us up to the total promised for this month's issue of Sengoku Basara Magazine, unless they're saving the last two for a sudden reveal in the magazine itself. It's hard to believe that we're just over two months away from the game's release!